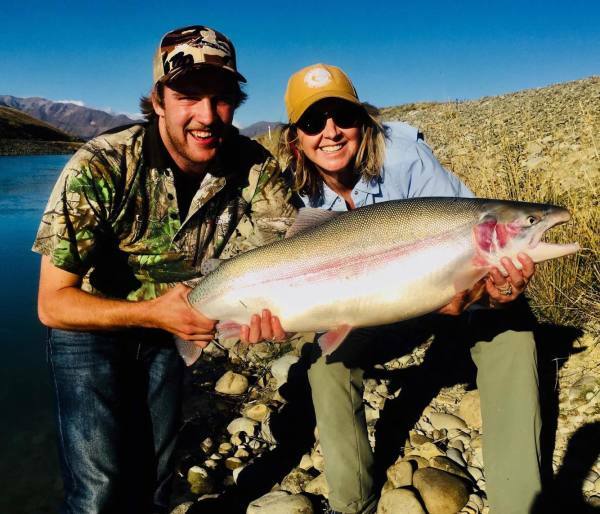 New Zealand also offers some first class fishing. The South Island has miles of braided rivers, pristine lakes and pure streams which are well stocked with Brown Trout, Rainbow Trout and Chinook Salmon..
Southern Peaks Safaris offer some of the most world class hunting you could find. 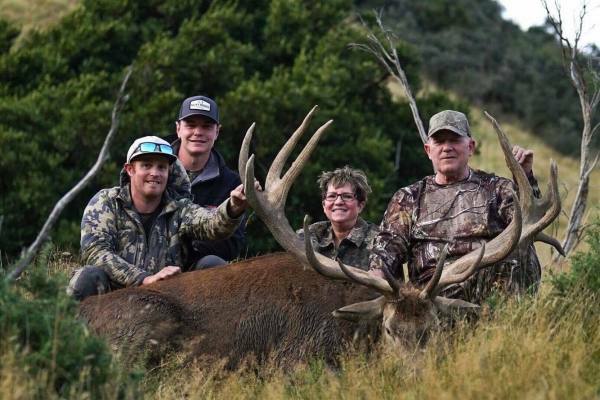 We have some of the most sought after animals in the world including Red Stags, Bull Tahr, Chamois and Fallow Bucks. Our hunting lodge offers first class accommodation, all rooms are self contained with your own bathrooms. All meals prepared by our local chef. The lodge is located 1.5 hours from the South Islands major airport (Christchurch). Mate thank you so much for setting up yesterday,was an eventful day and Darren is gold,left him with julz for her deer while we watched. Ben has obviously learnt a lot from you he was good to be with and a mule at carrying, we are keen to go back for a laugh! I have trout fished of many years in Australia but have never fished in New Zealand or fly fished before. I am very glad that I booked Sam as he is the perfect guide. He knows and had everything we needed for the day to ensure we successfully caught trout including lunch for us. He is friendly, professional, extremely knowledgeable and patient. From not ever fly fishing before he showed and taught me the basics and from there as I caught each fish with his guidance my confidence grew each time. Along with the fish we caught and the photos he provided I have a lifetime of memories to cherish of that day. If....no no when I go back to New Zealand I will definitely be booking with Sam again and would not bother looking elsewhere for a guide as he proved his worth that day with his years of experience, friendliness and extreme patience. Thank you Sam!! " I hunted Bull Tahr on public land with Southern Peaks Safaris in 2017. 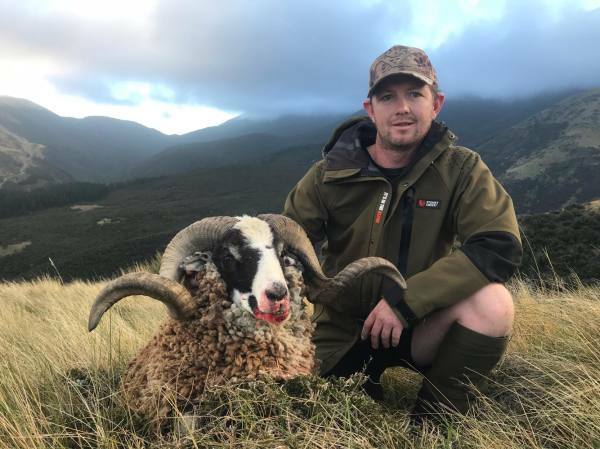 Im a pretty experienced hunter from the states (i'm the online editor for Outdoor Life magazine, a national Hunting and Fishing magazine) and was in New Zealand for my honeymoon. Because it was my honeymoon and my new wife was not a hunter, i had a few days to dedicate to the hunt. i wanted to chase free range animals and didnt want to spend a ton of money for a hunt on private land. Sam and the guide did a great job of finding a hunt that fitted exactly what i needed. We stayed in rental houses in town and then drove to the mouintans to hunt. Even though we stayed in town, the country we hunted was extreamly rugged and it felt like real wilderness. I chose not to go with the helicopter (partially to save money and partially for the challenge) and climbing up to where the Bull Tahr live was a hell of an exoerience. It was one of the tougher mountain hunts ive been on and also one of the most fun. I killed a Bull on the second day of our hunt. I hit him a little back - lung shot, but i was trying to break for the front shoulder and drop him on the spot. The bull ran just a short distance and died. But in that "short distance" he scaled a ravinethat would be treacherous, potentially dangerous for us to climb. My guide was up for it, but i had no technical climbing experience and we were running out of daylight. So we wisely opted to have a helicopter to come and pick us up then take us across the ravine to the Tahr. The guide and Sam loaded the bull onto the helicopter and we were off on our way. The safe ride out was well worth it. I got a birds eye view of the mountain that had taken us all day to climb. Id highly reccomend going with a free range, public-land hunt (whether its for Tahr, Stag, or Fallow deer). Sure, youll shoot a bigger animal on estate but theres no better trophy than a hard earned free-range animal. Ive been lucky an have had the opportunity to hunt a variety of animals all over the states. 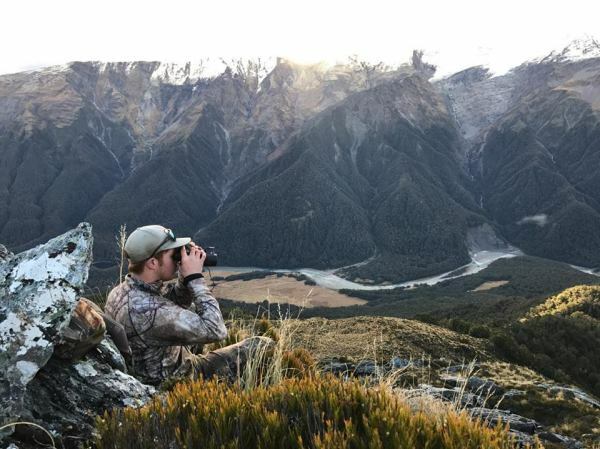 But hunting in New Zealand is something else altogether. Its hard to put into words, you just have to go do it yourself. Out off the swag for a morning hunt, plenty of bucks spotted. 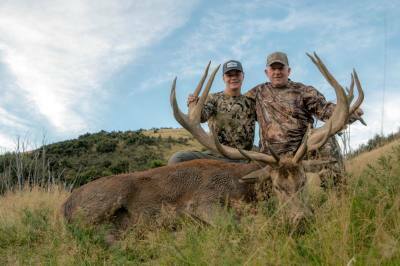 When I propped him pulled a very impressive shot I can only describe it as being one of a pride, it's a amazing experience and a awesome hunt thanks to Sam Radovonich! 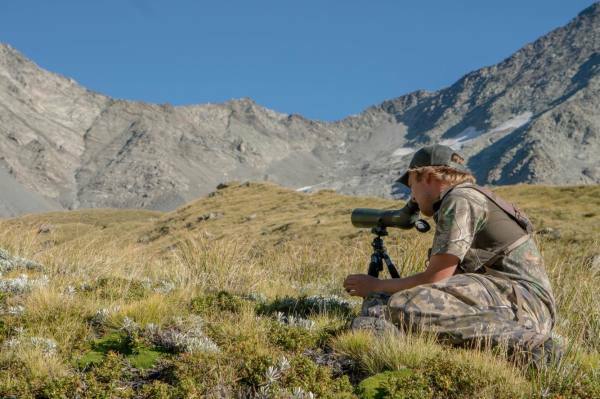 Southern Peaks Safaris was our choice for the perfect New Zealand hunting adventure. After much research and many emails, Sam and Shawnee proved to be very helpful and knowledgeable and we could tell they were as excited as we were to begin this trip. We were picked up from the airport and taken to a beautiful, comfortable apartment. 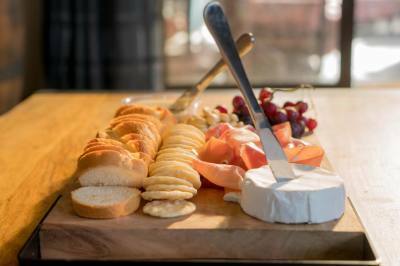 The meals that were prepared by Shawnee were five star and the desserts were mouthwatering. The red stag and bull tahr hunts accommodated our age and level of fitness. Both were terrain tough but very enjoyable. I was extremely satisfied with both animals taken and Sam proved to be an excellent guide. After the hunts, Shawnee was our driver for a beautiful tour of the island. Her planned route took us to the most popular sites we could squeeze into our timeframe. It was a wonderful trip that we most likely would not have been able to enjoy had we rented a car and driven ourselves. When Sam and Shawnee left us at the airport we felt we not only had enjoyed a trip of a lifetime with the topnotch accommodations and hospitality; we had also made friends that will not soon be forgotten. Thanks Sam, Shawnee and crew! conversation, I knew very quickly that I’d found the right outfitter. were more than adequate and the food was delicious…Shawnee is one heck of a cook! would be fluid and executed without issue. booked to head back and get my Tahr with the professionals at Southern Peaks Safaris.